With more than 75% of users logging in daily and refreshing their Newsfeeds 11-15 times a day, this social media giant is the place to be when it comes to engaging existing and potential business customers. When Facebook sees your users commenting on and sharing your posts, it allows additional organic reach. 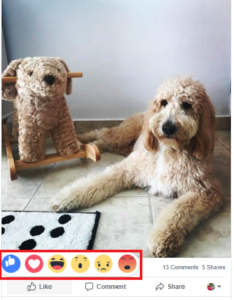 Facebook is far more likely to boost Reactions than Likes. It bolsters organic reach for posts shared by users via Messenger even more. Facebook likes to see comments on posts, so whenever a user comments on your post, reply in a timely manner. Facebook wants to make sure Business Pages focus on creating content that users enjoy. Organic reach improves when users spend more time on your posts. Create engaging, interesting, timely content that users will want to share with their friends. Remember: users are more likely to share content that is humorous, timely, relational and inspirational. Use keywords connected to current events whenever they’re relevant to your business or customers. Post when your audience is most likely to be on Facebook. (Find this information in your Business Page Insights). Video content is becoming more crucial to organic reach. Ideally, videos should be long enough to engage but not too long. BuzzSumo found that the optimal video length is 60-90 seconds. Include subtitles or closed captioning because a whopping 85% of Facebook users view videos without sound, according to Digiday. Upload your video directly to Facebook; don’t link to Youtube or other video hosting services. Facebook likes to keep users on its platform, so avoid outbound links whenever possible. Have a complete Business Page Profile. Consistently reply to messages you receive. Vary your post type (video, text only and images) and post Facebook Stories. Posts that encourage users to enter giveaways or contests. Posts that contain outbound links. At the end of the day, consistent, authentic content is one of the best ways to ensure that your followers will see what you’re posting on a regular basis. Create posts your followers want to engage with and share with their family and friends. Doing so will build your organic reach and it’s a powerful – and free! – way to build momentum for your business through word-of-mouth.